Ever take a ghost tour and notice that every single stop seems to be an “Indian Burial Ground?” If that’s all the guide can come up with, you’re probably on a b-rate tour. But there are, in fact, PLENTY of burial grounds, Indian and otherwise, that have been built over in Chicago. One estimate puts forth that there could be a million unaccounted-for graves in Chicagoland. 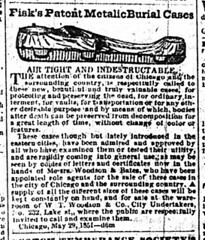 We haven’t uncovered any evidence of one of those parties taking place in Chicago YET (just a graphic description of one from NY that was in the Trib), but we DO know that iron coffins, designed to look about like Egyptian sarcophogi and to preserve corpses better than a pine box, were on sale in the city. We know that they were in use in Chicago, because in 1998, one was dug up just north of the Chicago Historical Society, in what is now Lincoln Park – but was once the City Cemetery. Somewhere around the lines of 25,000 people were buried in the Lincoln Park era from about 1844-1866. No one can really guess how many of them are STILL buried there, but it’s generally known that quite a few of them (perhaps even most of them) didn’t get moved. When the Historical Society dug out earth for a new parking structure, they found partial remains of 81 different people – and one Fisk Metallic Burial Case. Pamela Bannos has done fantastic research into the history – and remains – of City Cemetery. Click the link to see a page that includes video of the 1998 excavation.